HANDMADE PRODUCTS MADE BY SANTA CRUZ ARTISANS AT LIVING WAGES. ALL PROCEEDS DIRECTLY BENEFIT ARTISANS AND THEIR FAMILIES. We offer beautiful handmade products made by artisans trained at the CECAP Vocational Training Center. All artisans receive a fair wage for their work and enjoy the flexibility to work in the home with their families. Our artisans also receive non-economic support such as empowerment workshops and nutrition classes. 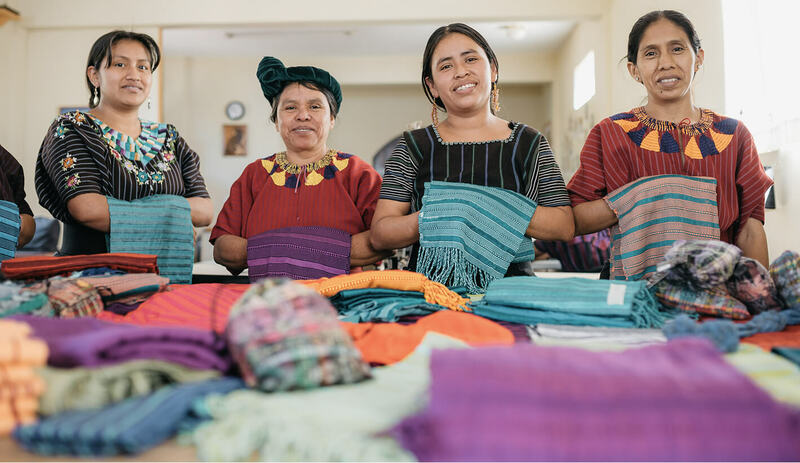 Our artisans weave, bead, crotchet, and embroider specialties like our woven shawls and upcycled aprons and cushions made from traditional Guatemalan blouse and skirt fabrics. CAN’T MAKE IT TO SANTA CRUZ? You can still shop for our most popular items in our new online store. Your purchases support Santa Cruz women artisans to make a living and support their families. We welcome wholesale customers and can offer discounts depending on the size of your order. Our artisans are also available to design and produce custom orders to suit your needs. Our products ship world-wide. Interested in learning how our artisans make their beautiful products? Join a hands-on beading class and make your own custom beaded friendship bracelet with our local artisans. Classes available in English, Spanish and Kaq’chikel. For an authentic Mayan village experience, take a weaving class in an artisan’s home and learn how to weave your own scarf on a belt-strap loom.